A very unconventional place is The Australian Insect Farm - a private property at tiny Garradunga, just north of Innisfail, on the coastal fringe of Far North Queensland. Jack Hasenpusch Against a back drop of rural development the owner-operators of the Australian Insect Farm have established a viable ecological farm with the potential to generate economic incentives for the retention of rainforest. The operators, and occupiers of the property for some 15 years, are naturalists Sue and Jack Hasenpusch, and their son Paul. The property retains 80 ha of lowland rainforest (a relatively good sized chunk these days) with many 'pioneer' (veteran) trees present. About one quarter of the forest is 60 year old regrowth. The bushland supports such notable wildlife as Southern Cassowary, Striped Possum, Musky Rat-kangaroo, Orange-footed Scrubfowl and Australian Brush-turkey, as well as a huge diversity of invertebrates. Australia's Bird of Paradise the Trumpet Manucode has been observed on the property. One obvious objective of the farm is to generate income. To this end, the bush on the property is used to produce invertebrate breeding stock from which live specimens are sold and exported. This is achieved in a very selective manner and within strict licensing constraints. The production of bred insect stock is highly sustainable due to the ecological viability of the retained bushland. Through careful protection and maintenance of the rainforest ecosystem, it becomes possible to replenish and continually diversify captive invertebrate stocks, based entirely upon the natural communities occurring on the property. Scientific observation and research are also facilitated, which in turn can enhance breeding and management expertise at the farm. This ties in with the other major objective - to provide effective education and display opportunities. The operators together have so much acquired knowledge of the plant and animal dynamics on the site, and are so ecologically benign in their operations and management, that there is an enormous amount for virtually any visitor to learn. In particular, Sue, Jack and Paul try to convey the vastness of diversity that even a relatively small rainforest remnant can contain. Film crews find the facility of great use. The facility contains many interesting live specimens including giant cockroaches, charming creatures suitable for handling; large stick-insects (including one spiny species featured in the Indiana Jones movie 'Temple Of Doom'); flower beetles; rhinoceros beetles; mantids; water bugs; scorpions; centipedes; giant tree-crickets; larval, pupal and adult butterflies; and the spectacular Hercules moth in various stages of development, the huge females hanging aimlessly from the ceiling on their newly-vacated pupal cases. It's clear that the Hasenpuschs have acquired a vast amount of ecological insight by living on their 'study area' for so long, whereas most conventional rainforest studies involve researchers undertaking only periodic field visits to this type of habitat. A second element of the farm is a walk-in flight enclosure immediately in front of the breeding facility. This shade-cloth covered structure contains established rainforest shrubs, carefully selected to provide a food source only for specified invertebrates, such as stick insects and tree-crickets, of which there are some huge specimens present. A variety of butterfly species are also present. Since many rainforest invertebrates are highly host-specific when choosing a plant upon which to lay eggs, breeding within the enclosure can be controlled, and an ecological 'explosion' therefore avoided, by rationing particular host plants. Nectar availability for butterflies is also controlled, as some species will simply gorge themselves to death. Naturalness is aimed for in the enclosure - even spiders are tolerated, their depredations upon the other residents being treated as a normal process. The Hasenpuschs have brought to light many new species, as well as new genera in the phasmatid, coleopteran and tettigoniid groups. 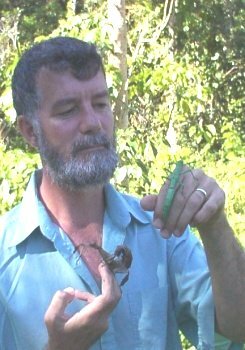 The Australian Insect Farm is a far sighted and community oriented exercise in voluntary conservation, made viable by the combination of a biologically rich and spectacular tropical rainforest environment, a sound land management ethic and a remarkable level of interest and motivation on the part of the Hasenpusch family. from Land for Wildlife News Vol. 3. No 10.